100% non-smoking facility; wonderful breakfast cafe in lobby serving al-la-cart, breakfast buffet, and made-to-order omelets; indoor pool and jacuzzi; 25 hour fitness center; cocktail lounge and bar; free wireless internet throughout hotel with complimentary computer and printer access in lobby; meeting services and catering up to 200 people. Bradley International, 44 miles from hotelShuttle not available. Taxi fare is approximately $60-80. Continental buffet includes cold cereals, yogurt, fresh fruit, breakfast breads, pastries, juice, milk and coffee/tea. Price for adults is $7.95.Full hot buffet includes all continental items plus eggs cooked to order, sausage, bacon, homefries and waffles. Price for adults is $10.95.A la carte menu is also available. 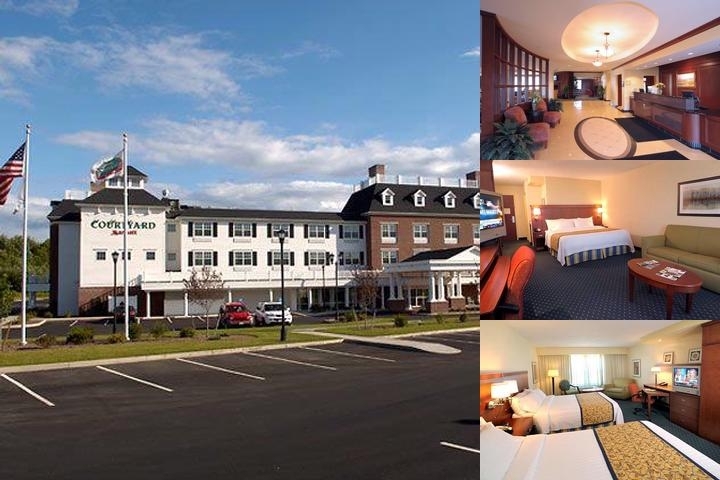 Below are the meeting, banquet, conference and event spaces at Courtyard by Marriott Hadley Amherst. Feel free to use the Courtyard by Marriott Hadley Amherst meeting space capacities chart below to help in your event planning. Hotel Planner specializes in Hadley event planning for sleeping rooms and meeting space for corporate events, weddings, parties, conventions, negotiated rates and trade shows. One half of the Ballroom features a built in bar window, which can remain open for social events such as weddings or Bar/Bat Mitzvahs, or closed for business or class meetings.One half of the room has 2 windows, while the other half features French doors which open onto our Courtyard (Courtyard is accessible to all hotel guests). 45 x 64 x 10 Ft. In place of windows, the Hadley room has a half-wall of French doors, which open onto our Courtyard (accessible to all hotel guests). The room also features a built in bar window, which can remain closed for business meetings or open for social events. 45 x 32 x 10 Ft.
Room is ideal for small board meetings. The room also connects to a ground floor king-bedded suite, which makes it also useful as a bridal suite. 19 x 12 x 9 Ft.
45 x 32 x 9 Ft.
64 x 45 x 10 Ft.